Aquabot allows you to cool off, clean off, hydrate and have fun with just your water bottle. It has shower, stream and mist patterns and sprays over 25-feet. It is BPA free and requires no batteries. Aquabot is perfect for youth sports, military, camping, pets, hunting, fishing, gardening and more. You will find Aquabot useful for hundreds of tasks. Aquabot makes drinking more fun and easier. The mist keeps you and your pets cool at any outdoor or athletic event and even work. The shower cleans gear, camp dishes. and body parts. Fits most 63mm wide-mouth bottles. 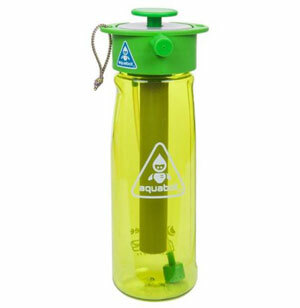 BPA-free and easy to drink from. Pump it to build pressure. Battery-free. Perfect for camping, fishing, picnics, gardening, sports, pets and more.